Yeah! That's right! It's a Peanuts collection. I recently planted myself, like some gruesome vegetable, at my sister's and read this for a couple of days. Peanuts shouldn't need any introduction of course; everyone knows about it and it's characters, right? No?! Some of you out there are shaking your heads, or looking a little sheepish. Okay, so there was this young cartoonist called Charles M. Schulz who decided to create this world (alomst solely) inhabited by a cast of small children and a dog named Snoopy, and so, Peanuts was born! Okay, so I may have missed a few steps, and left out any 'struggle to become a famous comic strip artist/writer' bits, but that's because we all know of course (or should know) that Mr. Schulz did make it, in a big way. Anyway, the picture above is a shot of the first collection. That's right, the first proper Peanuts daily and sunday strips. 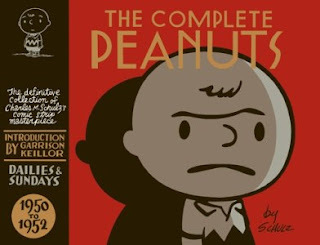 In this collection you'll find over 300 pages of hundreds of shorts, all realized, written and drawn by Charles Schulz. Plus a sizeable essay on Schulz, an epic interview with Schulz himself and an introduction. It's a great collection too. Right from the off that gentle, Schulz-brand humour shines through; whether it be delivered through slapstick, a running gag or some quick, quirky, meaningful monologue delivered by Charlie Brown, one of his friends, or even his best pal Snoopy. It's nice to see the characters at their origin; Charlie, Lucy, Violet, Shermy, Patty, Linus (before his comfort blanket!) and Shroeder are all slowly introduced to us. Shroeder, is probably easily the character who evolves the most through the progressing strips. And, before you know it, he discovers his love of Beethoven and his attachment to his toy piano. Of all of the characters that first appear here, in this collection, Lucy has to be my favourite. Her wide-eye, almost vacant stare, and her dopey grin are instantly appealing. She seems to defy the laws of gravity and physics now and then too; it's almost as if, because she isn't aware of them, they do not work for her. In one strip Charlie Brown watches her bounce a ball, and stares on in disbelief when, after she walks off to get lunch, it continues to bounce in place on it's own.